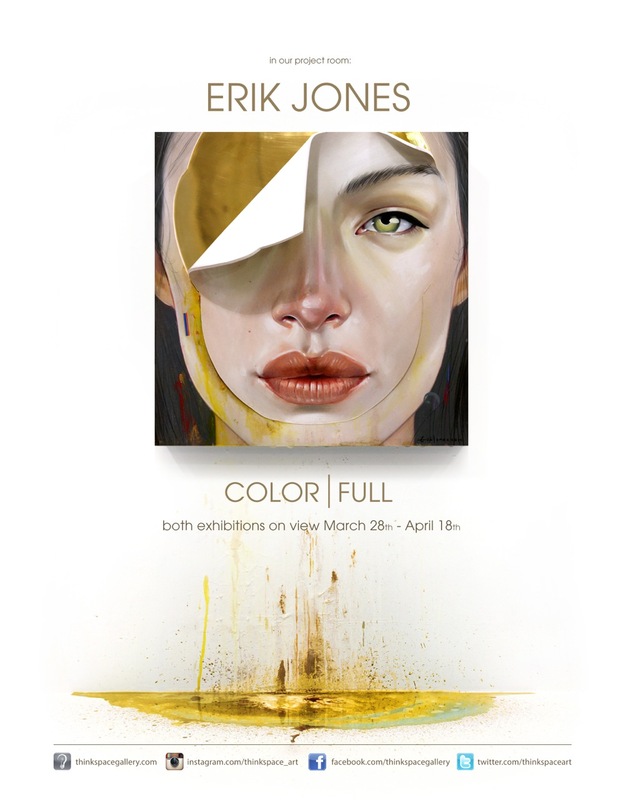 Concurrently on view in the Thinkspace project room are new works by Erik Jones in Color/Full. Originally from St Petersburg Florida, Jones currently lives and works in New York city. 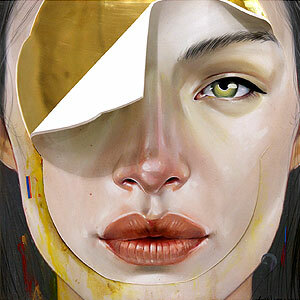 His technically complex mixed-media works combine the figurative with the geometric in seamless collusion and concert. Jones’ hyperrealistic figuration is offset by geometric patterns and momentums that seem to live and breathe as symbiotic organisms. The figure is ensconced by these colorful geometric expanses, as each “wears” the other and becomes virtually indivisible from its counterpart. Clothed by pattern and color, the body is set within and against expressionistic modules of sculpted graphic space. In his new body of work, Jones takes his penchant for spatial play and surreal composition to the next level in a series of Dimensional Paintings. These works invade the third dimension, literally, as surfaces peel from their supports, images slide from the walls, and paint pools on the floor. Jones begins his works by compiling a figurative reference from several photographic images, then designing harmonious geometric fields by compositing form, color and shape digitally. The composition is then projected and traced onto paper and materially executed with several painstaking layers of watercolor, ink, pencil, oil pastel and acrylic. This expert combination of illustration and painting techniques accounts for the depth and dimensionally of the work. The combination of graphic patterning, color blocking, line and hyperreal figuration meld into an entirely elevated visual plane of oppositional, and yet entirely confluent and continuous, axes. The visual delight of these paintings resides in this inspired reconciliation. The Dimensional Paintings take this impulse to the next level by revealing some of the materiality and process that remains otherwise concealed in the high finish of the work. This intentional disclosure of tension and process – a literal stripping and dismantling of planes – takes the paintings into a sculptural realm, revealing the artifice and construction of their dynamic oppositions. As the title of the exhibition suggests, the work is full; saturated to the point of rupture, the paintings burst with color and movement, and spill unapologetically into real space and time.